The former Brother-in-Laws/Da’ Pitt. 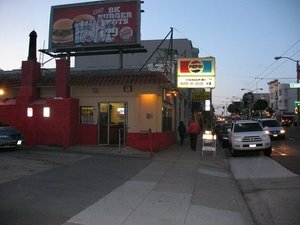 Yelp photo by Bill B.
Super-exciting news to share about my beloved Western Addition: Ryan Farr of 4505 Meats is going to be opening a barbecue spot in the former Brother-in-Laws/Da ‘Pitt on Divisadero. Many have wondered who was going to claim the space, and I am so damn pleased it’s someone who is going to do justice and pay honor to the last barbecue pit in the city (and not some developer who wanted to raze the place and build something lame on that lot). I just got confirmation on the rumor that yes, 4505 Meats is going in, and will have details to share in my column on Friday. Stand by, and get ready for the sweet smell of barbecue to waft through the ‘hood once again. 705 Divisadero St. at Grove.